Manchester, New Hampshire – Junior middleweight prospect and 2008 U.S. Olympian Demetrius Andrade proved to be too much for former world title challenger Saul Duran on Wednesday night at the Fight to Educate card held annually at Verizon Wireless Arena in Manchester, New Hampshire. Demetrius Andrade proved to be too much for former world title challenger Saul Duran on Wednesday night at the Fight to Educate card held annually at Verizon Wireless Arena in Manchester, New Hampshire. Andrade dished out punishment for 3 rounds, managing to floor the challenger at the end of the second and third rounds. Duran did not answer the bell to start the fourth. Andrade, who up until recently has been an unproven prospect, now holds wins over two legitimate, but past-their-prime opponents, in Grady Brewer and Saul Duran. With the win Andrade improves to 15-0, with 10 knockouts, while Duran drops to 38-19-2. It was a quick evening of even quicker knockouts at the annual “Fight to Educate” benefit show at the Verizon Wireless Arena in Manchester, New Hampshire on Wednesday night. 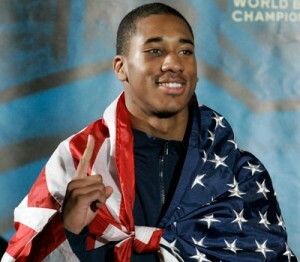 In the main event, 2008 US Olympian and rising pro junior middleweight Demetrius Andrade (15-0, 10 K’s) stopped Mexico’s former two time world title challenger Saul Duran (38-19-2, 31 KO’s) in a catchweight bout at 157 pounds. Andrade was in control from the get go, but Duran was game for the first few rounds. In the 2nd round, Andrade scored an official knockdown in what appeared to be a push more than anything. In the 3rd a right hand from Andrade forced Duran to turn away in pain and a left hand as he turned away put him on the canvas. Duran got up in time to beat the count and the round ended. However, in between rounds he opted to quit. -In middleweight action, upset specialist Jose Medina (15-9-1, 7 KO’s) had a rare fight that he was favored to win against faded 1992 Puerto Rican Olympic bronze medalist Anibel Acevedo (13-8-1, 11 KO’s). Medina did win when Acevedo quit on his stool following the 2nd round. Medina dropped Acevedo in the 2nd round with a right hand. Acevedo beat the count, but didn’t want to continue in between rounds. -In the welterweight division, 2008 US Olympic alternate Danny O’Connor (15-1, 4 KO’s), returning to the ring for the first time since suffering his first career loss to Gabriel Bracero on a Shobox televised bout earlier this year, won via 1st round TKO over Jamal Del Cid (7-6, 3 KO’s) when he scored a knockdown with a combination culminated by a final left hand that put Del Cid on the canvas. Del Cid beat the count, but didn’t seem too interested in continuing. It was O’Connor’s first fight under the guidance of new trainer Ronnie Shields. -In a featherweight fight, Claremont, New Hampshire’s Dan Powers (4-0, 2 KO’s) was forced to go the distance for the second time in row and second time in his young career by winning a unanimous decision over Massachusetts’ Luis Rosario (4-16, 2 KO’s)by scores of 40-36 three times. Powers, fighting in his home state for the first time since his pro debut one year ago, dominated the older and bigger Rosario landing the harder punches at a better workrate for the duration on the bout. -In the opening bout of the evening, Windsor, Vermont’s Chris Gilbert (2-0, 2 KO’s), fighting the closest to home he’s fought as a pro, wasted no time in disposing of Springfield, Massachusetts’ Noel Garcia (2-12-1, 1 KO) as he landed a beautiful right uppercut that scored a knockdown in the first round. Garcia made it to his feet, but was unsteady and the fight was waved off at 1:33 of the round. The fight was a junior middleweight contest with Gilbert weighing 151.2 pounds and Garcia weighing 147.4 pounds. MANCHESTER, N.H. - Providence light middleweight Demetrius Andrade stayed unbeaten on Wednesday night with a third round TKO over Mexico's Saul Duran in the main event of the 10th annual Fight To Educate card at the Verizon Wireless Arena. Enjoying target practice for the full three rounds, Andrade (15-0, 10 KO) dropped Duran at the end of the second and third rounds, unloading a series of crisp, hard punches. Duran was unable to answer the bell for the fourth round. Now rated No. 14 by the World Boxing Council and No. 15 by the World Boxing Organization, the 23-year-old Andrade, a 2008 U.S. Olympian, appears to be closing in on a major fight in 2012. "I came out aggressively," Andrade said after the fight. "The plan was to use my jab. He had a soft stomach and didn't look like he was in great shape. "As long as I use my speed, everything is easy. He's a tough fighter who took some good blows. I hope to fight once more before the end of this year." MANCHESTER - Danny O'Connor didn't show up at the Verizon Wireless Arena yesterday just to fight his opponent and collect a check. Instead he was there to fight for a cause near and dear to his heart. O'Connor explained that on March 10 of this year an up-andcoming Mixed Martial Arts competitor, Douglas Bolanes, died in a car accident. Two months after Bolanes died, O'Connor said Bolenes' father also died in a car accident. Last year Dan Powers of Claremont made his pro debut in the Fight to Educate and knocked out Johnny Dippolito in the second round. The win propelled Powers to two more four-round victories in Dorchester, Mass. Powers was a six-time Golden Gloves champion from Vermont and his wife, Chauntelle, also fought in the Golden Gloves circuit three years ago. “It's kind of neat to say we're the first husband and wife team to have competed in the Golden Gloves from Vermont,” said Powers. Win, lose or draw last night, New Hampshire Boxing and Wrestling Commissioner Bobby Stephen said Demetrius Andrade was gauranteed to make $10,000 in his fight last night against Saul Duran. Former New England great “Irish” Micky Ward couldn't attend the event Wednesday night (he said he was throwing out the first pitch at the Red Sox game), but he uttered some words of advice for the young fighters at the Fight to Educate from his Lowell, Mass. home. Ward, who trains boxers at the Micky Ward Boxing Gym in Chelmsford, Mass., said he's saddened when he sees young boxers choose their opponents. John Ruiz, Gerry Cooney and Vinny Paz were in attendance last night. All three men were gracious in giving their time to anyone seeking their autograph or picture. Paz said he left boxing having achieved a goal that he felt was similar to a pitcher winning 300 games. “There are not many fighters who can say they won 50 bouts in their career like I did. That's a rare feat and I am proud to say I accomplished it.” Cooney, still looking like he could step into the ring and knock someone's block off with his huge frame, said he's enjoying the role of being an ambassador for the sport.